What to Make of the Canon EOS 6D Mark II. Canon today announced the second version of their "budget" full frame DSLR, the US$1999 6D Mark II, and on National Camera Day, which at least shows some attention to marketing detail ;~). There are some interesting contrasts in this iteration that are going to generate some controversy, I think. Article on dslrbodies.com. 6D Mark II Data Page. Rebel SL2 Data Page. 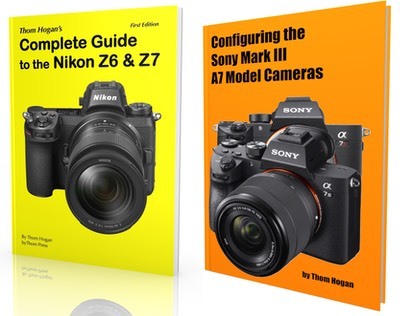 It has been a bit of a lens week, what with my two Olympus lens reviews, two new lenses announced, and two lenses finally with final details released. The two new lenses are the Zeiss Milvus 35mm f/1.4 and the Tamron 18-400mm f/3.5-6.3. The two lenses with pricing and availability details now available are the Sigma 14mm f/1.8 and the Sigma 24-70mm f/2.8 Art. No article on the new lenses, but here's a short take: The Milvus looks to be about the best 35mm f/1.4 you can get, but it's manual focus only. The Tamron is the latest step in their attempt to superzoom the superzoom. The MTF numbers and sample images on that lens didn't excite me, and a 2.5 stop OS at 400mm isn't much considering this is a DX/EF-S lens and you're really at 600mm effective. Meanwhile the two Sigma lenses have looked appealing since they were first announced in February, so I'll be looking at them carefully when I can finally get copies. Note a trend, though. The Tamron and Sigma lenses are all electronic aperture (Nikon's E-type), which means that they work with D300 and later cameras only (though not the D3000). See this article for lens compatibility issues. And in my D7500 blog: The Cheese Has Been Removed. What's with Nikon New Zealand? Are they so down under they didn't get the message about the DL's being cancelled? In case you haven't noticed, there's a new D7500 blog page, where I'm putting up short comments and articles as I begin testing the new Nikon D7500 DSLR. This is similar to what I did with the D5/D500 last year. I've also updated my Recommended Mac Hardware article to account for the new models that Apple announced last week. This site's exclusive advertiser, B&H, carries all the models I mention.